Most companies have accepted the fact that data is the new oil of the economy and the proper use of big data analytics is a key competitive advantage and driver for innovation and growth. At the core of this is the need for organizations to make better data-driven decisions across the different business processes and functions in the organization – marketing, risk, supply chain, operations, etc. However, data-driven decision making cannot reach its potential unless organizations scale the use of analytics on a continual basis. One commonly recognized roadblock to the wide spread use of Big Data and analytics is the talent shortage. Research organizations have written extensively about the dearth of data science and analytical talent in the market place. The talent shortage is definitely one piece of the puzzle. However, institutionalizing analytics is not just about people. Rather, it requires the right man-machine combination of people, processes, tools and technology platforms. If one ignores any crucial ingredient our attempt to scale and democratize the use of analytics will not be served. To enable creation and consumption of analytics, and develop a better art for problem solving, the individual components of the Decision support ecosystem i.e. people, processes, tools, and learning technology platforms must come together as bionics. This provides foundation for institutionalizing decision support via analytics. To support the ultimate objective of any analytics initiative, i.e. enabling better decisions, organizations will require the right talent pool. Today there is a lot of focus on Data Sciences and Data Scientists. However Data Sciences just represents the intersection of Math and Technology skills. However what organizations need is an interdisciplinary approach of technology, business, applied math and behavioral sciences to help enable better decisions. The business analyst, the applied mathematician and the programmer need to come together in one individual to help solve constantly evolving business problems that organizations face. This is an important differentiator that separates a Decision Scientist from a Data Scientist. Decision Sciences professionals work on solving complex business problems. This requires emphasis on design thinking, hypothesis generation and representation. Processes should focus on the “Art of problem solving” with structured approaches for problem definition, analytical solution design, insight generation and quality checks. It is not only about the creation and execution of big data analytics, but also translation between the business and analytics perspectives and enablement of consumption. It is imperative to have processes that facilitate an objective yet context sensitive language through which multiple stakeholders in the organization can communicate and collaborate. Decision Sciences and analytics require conceptual and practical mastery of various tools and technology platforms across the different kinds of big data analytics questions – Descriptive Analytics, Inquisitive Analytics, Predictive Analytics and Prescriptive Analytics (DIPP™ spectrum). These include advanced math tools that enable techniques across a wide spectrum of math disciplines (statistics, machine learning, text mining, etc. ), problem definition tools, database technologies, ETL technologies, business intelligence platforms, visualization tools, Big Data technologies, etc. What is also important is a learning mind-set, where focus is on constant learning and honing of skills. Besides using industry standard tools and technologies, companies must strive to invest in assets and platforms which can empower enhanced productivity, knowledge management, collaboration / sharing of best practices and support to big data analytics delivery. These can help scale the use of analytics; address both the art of problem solving as well as address specific problems. Businesses are constantly looking for innovative avenues to address their key concerns. Typical business practice would suggest looking for deep expertise in one’s own industry. But as business models transform and evolve, organizations can learn from best practices across domains and industries. For example: online advertising networks can learn how to manage ad space by learning how airlines manage seats; a health care organizations could become more efficient by learning from the assembly chain operation in a manufacturing industry; or retail and financial services can learn about price optimization from Hospitality and Tourism industries. Having pioneered the art and science of Decision Sciences and big data analytics at scale, we at Mu Sigma provide our clients with a holistic ecosystem of proprietary technology platforms, processes and people, which scales the use of our unique interdisciplinary approach to Decision Sciences. This ecosystem sets the tone to making analytics commonplace in organizations, which forms the basis for sustainable data-driven decision support. 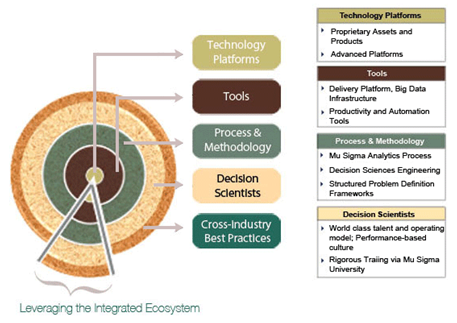 To understand more about our holistic ecosystem, our interdisciplinary approach and how we can partner with you to help you create and consume analytics better, visit us at www.mu-sigma.com.